Camelon Juniors are yet to lose a cup match, in any competition, in the 2018-19 season and hope to keep that run going against Lothian Thistle Hutchison Vale on Wednesday. Lothian Thistle are likely to provide stiff opposition, however, as they haven't lost a match in over two months - having won five on the trot. The match is a fourth round tie, with the winner playing Stirling University (Lowland League) in the quarter finals of the SFA South Region Challenge Cup. Stirling University's Lowland League side are certainly of a higher standard than their East of Scotland side, who Camelon defeated 6-1 on Saturday. And Manager Gordon Herd= was less than pleased with his side's first half showing in that 6-1 win at Carmuirs Park as they trailed 1-0 at the break before an improved second half showing sealed a comfortable win, and knows they will have to improve from the off against Hutchy Vale. 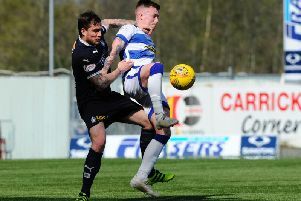 "Our performance levels have got to be much better than Saturday," he told the Falkirk Herald. "If we approach the game properly, there shouldn't be any issues. But if we don't and we are lethargic, like we were on Saturday, then we could come unstuck. "The prize is there for the guys, it's a fourth round tie and if we win we got into the quarter finals. "We know what is at stake, so there shouldn't be any complacency from the boys - there definitely won't be any from the management. "We have hopefully learned a lesson from Saturday."